Boil apple juice and wine in a large saucepan until reduced to 3/4 cup, about 30 min. Whisk in olive oil and Veggie Rub. Peel and cut vegetables into 1/2 inch pieces. Divide between 2 roasting pans. Pour apple juice mixture over vegetables. 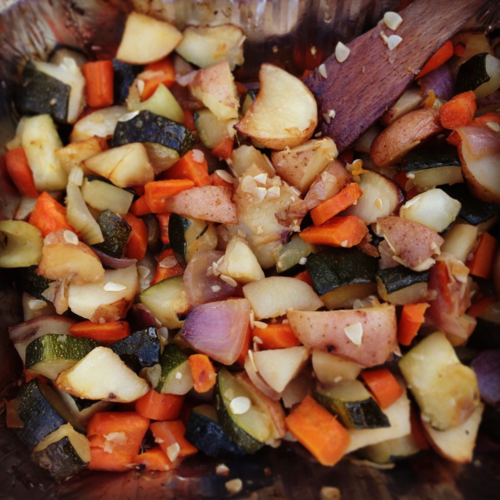 Roast until vegetables are tender & golden, stirring occasionally, about 40 min. The warm and cosy feeling I get as fall beckons makes me happy for the dwindling daylight. 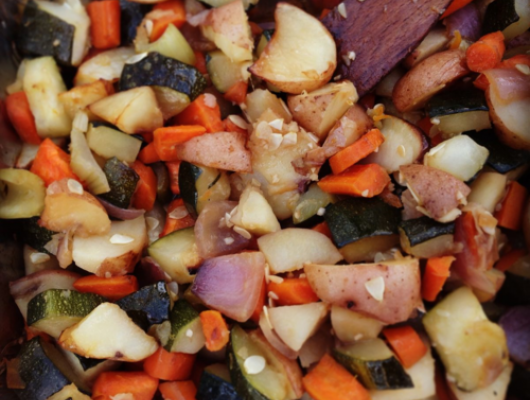 Root vegetables roasted in cider jus are an ode to that feeling.